To those who are unfamiliar with Japanese terms or how to pronounce them, (used on this page and others), you have my sympathy. 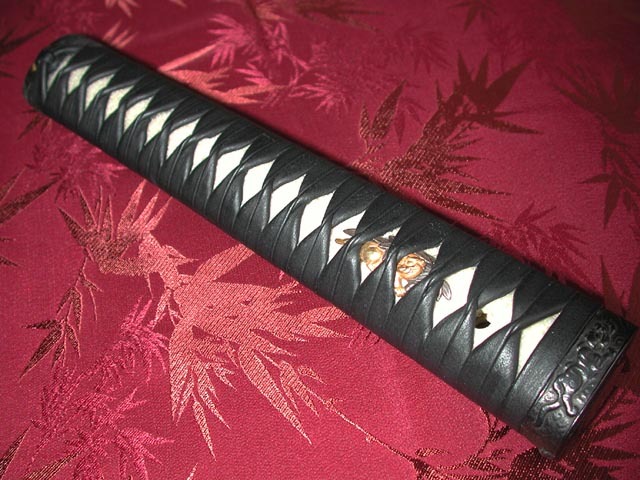 I prefer using the word 'handle' over Tsuka ...but Tsuka is the term used by collectors and practitioners of the 'slice and dice' philosophy. Tsuka-ito (also called Ito) is the Japanese name for handle cord. I guess it all makes sense, right ? Our synthetic suede handle wrapping cord (Tsuka-ito), referred to as Tsunami was developed in Japan for the use of Martial Arts practitioners. Because of its durability, great looks and high customer satisfaction, having your handle wrapped in genuine Tsunami now costs the same as Silk and Leather. Our exclusive Genuine Leather cord (Tsuka-ito) is now fully available. Our leather cord is judged to be the finest because it is NON-STRETCH and as a result, it can be tied tightly with the assurance that it will not stretch like a rubber band and loosen as other types of leather will.